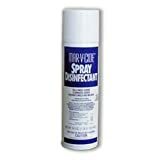 Cut your disinfecting costs with EPA approved Mar-V-Cide – a concentrated hospital-grade cleanser, disinfectant and fungicide – WILL CUT YOUR DISINFECTING COSTS. Also includes a special rust inhibitor to help protect your expensive implements. Can be used on implements (Shears, nail clippers, nippers, etc.) and hard surfaces such as counters and vinyl upholstery.